Pinoso is a traditional Spanish town located in the mountainous countryside of the Alicante/Murcia border. This traditional town is renowned for the production of fine wines, rock salt and marble. The history of Pinoso dates back to the times of the Iberians. However, the area was later settled by the Romans and later by the Moors during the Arab occupation of Spain. In 1743 the popular church of Pinoso was erected in honour of the Apostle Saint Peter. The whole area was largely unpopulated until the efforts of agriculture and human settlement began in the eighteenth century. The population grew from about 20 people to over 1000 in less than a century, and continued to increase until it gained its independence in 1826 from Monóvar. At first the main crops were wheat and barley, but by the mid-nineteenth century vineyards become the most representative of the town. In 200, Pinoso was the largest producer of wine in the entire province Alicante. The dominant variety is the Monastrell grape. Red, rose and white wines are produced in abundance in the area and form part of the "denominacion de origin" wine area of Alicante. The Parish Church of St. Peter the Apostle was founded in 1739 on the site of an old chapel. Gradually, the building was expanded and in 1888 acquired its current appearance. In the left wing houses the privileged altar and the chapel of the Virgin of Medicine, Patron of the town. 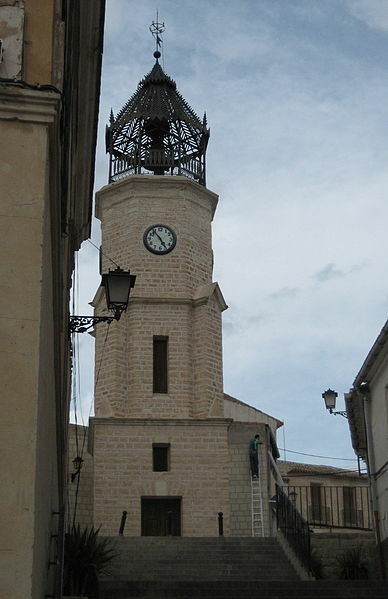 The Clock Tower dates back to 1887, with Mayor D. Francisco Rico Lucas, requested a tower project from architects Alicante D. José Guardiola Stang and D. Enrique Sanchez Sedeño. The clock was purchased in Madrid in 1899 for 11,000 pesetas and consisted of machinery, three bells and the four areas, weights for rope and a bell forged for support. The clock is still manual and works with three weights: 500, 200 and 100 kilos. , the big one is for the hours, the median for the quarter, and lower keeps the watch running. Ermita de Santa Catalina was built in 1989, carved into the rock of a small hill. Since 1926 until 1974 this was the site if a drinking water reservoir. Pinoso is a natural beauty that offers peace and tranquillity, surrounded by nature reserves, vineyards and olive groves. It is a prosperous town with all modern amenities including shops, bars, restuarants, etc. Pinoso is a town to be explored and enjoyed, a traditional Spanish town that is steeped in history and that celebrates Fiestas in a spectacular way. See below to view a selection of our bargain properties in Pinoso.